Red-tailed cuckoo bumblebee (Bombus rupestris). Photo credit: Derek Parker. A large red-tailed cuckoo bumblebee, with a big subquadrate head. Like all cuckoo bumblebees, this species does not collect pollen to feed offspring, but instead takes over nests of the Red-tailed bumblebee (Bombus lapidarius). Widespread but not particularly abundant across the south of the UK, the species has been increasing in abundance and spreading northwards in recent years. Male Red-tailed cuckoo bumblebee (left), Faded Red-tailed cuckoo bumblebee (right). Photo credits: Ron Rock (left), Bill Temples (right). Females are sparsely hairy and have very dark, almost black wings, unlike any similar species. 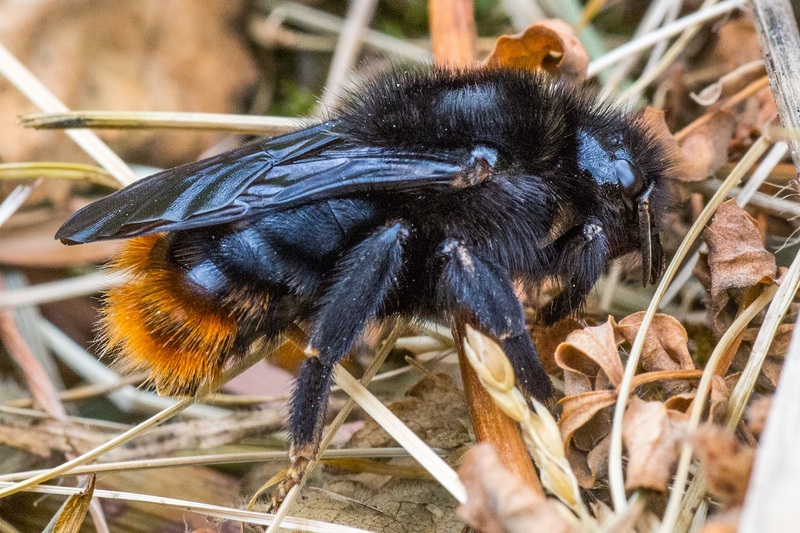 Males have largely undarkened wings, but the indistinct greyish-yellow banding and lack of obvious yellow facial hair separates them from the Red-tailed bumblebee and Early bumblebee (Bombus pratorum). The male genital capsule is useful to check the ID, particularly of worn specimens.